Christopher Samuel Carroll in "Icarus"
Inspired by news items reporting bodies falling from the sky, Christopher Samuel Carroll’s mesmerizing wordless creation, depicts, in minute detail, the story of a man who eventually becomes one of these bodies, and the circumstances leading to his attempt to stow away in the wheels of an air-liner with tragic results. 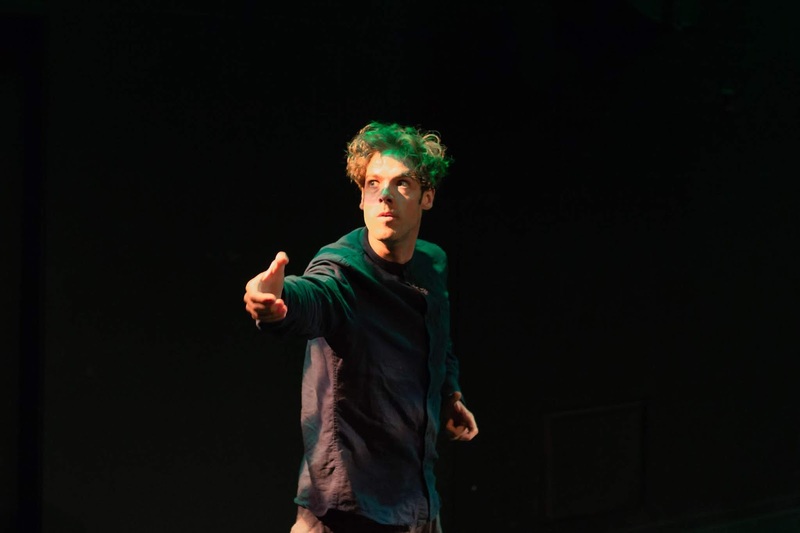 An Irish theatre-artist now based in Canberra, Christopher Samuel Carroll is a graduate of the Ecole Internationale du Theatre Jacques Lecoq, The Samuel Beckett Theatre Centre and Trinity College Dublin. 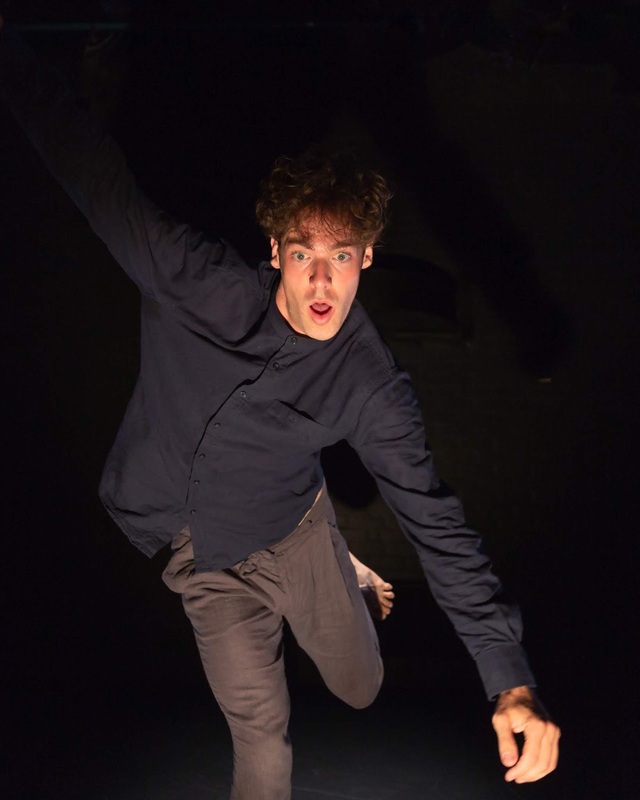 He developed this production through the Street Theatre’s First Seen: new works-in-progress program, and premiered it at the 2019 Perth Fringe Festival where it was declared Winner in the Dance and Physical Theatre Category. Performed in a simple ambiguous costume, on a bare stage, without the aid of props, but with an atmospheric soundscape by Kimmo Vennonen, and Jed Buchanan’s sparse lighting design, Carroll, uses just his own body, and his considerable skills as a mime artist, to create a narrative around a young man, obsessed with video games, with just his cat for company, who finds himself trapped in a building destroyed by a stray bomb. On the point of starvation, he eventually frees himself from the building, and after a series of adventures is inspired by the sight of a plane flying overhead to embark on a journey, which does indeed, take him too close to the sun. Drawing on the familiar mime skills made famous by Marcel Marceau, Carroll discards the white face, which gives his characters a more contemporary edge. His attention to detail, and the preciseness of his polished technique, allows the audience to quickly become engaged in his story- telling. So much so, that those lapses where he jolts the audience out of the carefully established conceit by inviting them to taste some imaginary food, or when he quenches his thirst by drinking from a wine glass belonging to an audience member, and during a sequence when he’s trudging through desert, and the soundtrack distracts with a reference to the theme for the movie “Lawrence of Arabia”, become more irritating than amusing. Carroll’s performance demands close attention from his audience, and leaves room for discussion as to how individual audience members perceive the various nuances of the story -telling, but for those wishing to experience an imaginative and unusual piece of theatre-making, this is a performance well-worth the investment. 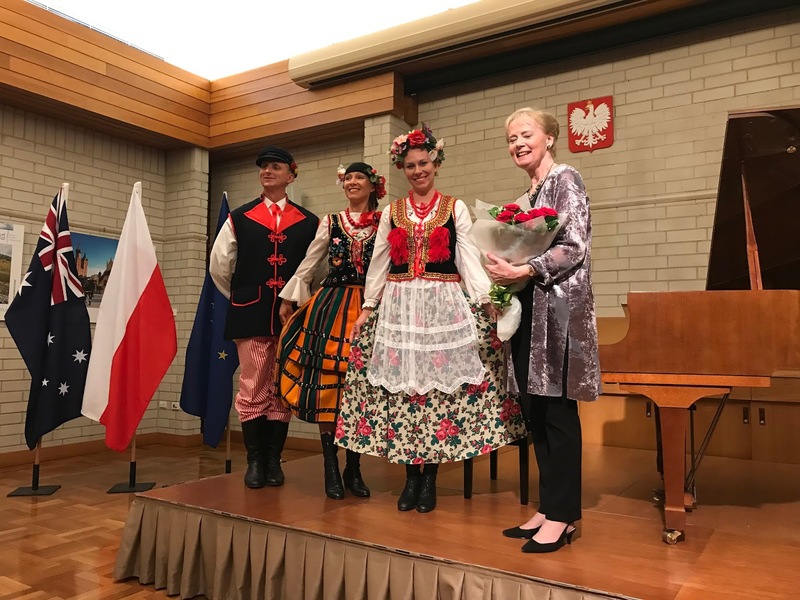 Pianist Penelope Thwaites plays her Chopin with mature authority, grace and style, but at this excellent concert at the Polish Embassy Thursday last, celebrating the 209th anniversary of the birth of Chopin, it was her performance of and the music of Percy Grainger which stole the show. Thwaites is one of the world’s leading authorities on the life and music of Percy Grainger and is the editor of The New Percy Grainger Companion. Grainger was a formidable pianist of titanic technique and his piano music was written for him to play. Others who follow have a serious task at hand. Thwaites delivered Grainger’s music with a command and assurity that is as close to channelling as one could possibly imagine. Her uncanny ability to capture the majesty, strength, power and delicacy of his music was captivating. During Irish Tune From County Derry the emotion wrenched at the heart and people everywhere misted up. From my seat in the second row, I most definitely caught a glimpse of tears from the pianist. The chords were rich and lush, the melody sang like a bird and the inner voices in the opening verse shone through superbly. The Power of Love, part of a Danish folk music suite by Grainger and arranged for piano by Thwaites was almost a Lisztian fantasy, recalling his Swiss Years of Pilgrimage. The concert had a multifaceted purpose. Chopin’s birthday aside, it was also a celebration of the folk music idiom and the influence this had on some of Chopin’s output, as well as Bach, Grainger and Bartok. In addition is was a concert dedicated to the Chopin music scholar Professor Miehyslaw Tomaszewski who passed earlier this year on 14th January aged 97. Many of his thoughts and reflections on Chopin’s music were included in the program notes. Thwaites herself provided excellent commentary on all the pieces and the evening actually became a sparkling lecture-recital. Beginning with two contrasting works - Chopin’s mournful Prelude in E minor Op.28 No.1 and J.S. Bach’s joyous Chorale Prelude, Thwaite’s continued with Bach’s Partitia in B flat major, playing the melody with bell-like clarity. A bracket of five Chopin mazurkas demonstrated exquisitely executed trills, authoritive and varied dynamics and a rich sonority of sound. The final bracket for the evening, also Chopin, brought forward three of his most famous waltz’s finishing with a majestic performance of the Grande Waltz Brillante in E flat major, Op. 18. The folk music theme was delightfully enhance by the presence of several adults and children in spectacular Polish national dress from different regions of the country. In a performance that spoke to and involved the audience in a musical, emotional and intellectual capacity of great magnitude, this Judy Dench of the piano finished with her own delightful musical setting of Shakespeare’s Under the Greenwood Tree, reflecting influences from Ralph Vaughan Williams and John Ireland. Princess Theatre Melbourne from 23rd February 2019. In only its third production, following London and New York, the gargantuan show that is Harry Potter and the Cursed Child has finally arrived in Melbourne in an extraordinary production which certainly lives up to the hype. 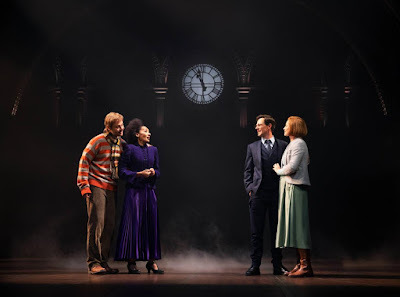 With a total running time in excess of five hours, designed to be viewed in two sessions, either at a matinee and evening performance, or over two consecutive nights, the show never drags. In fact it doesn’t seem long enough as it grabs you by the short and curlies, from the very opening scene on Platform Nine of Kings Cross Station, where the now adult Harry Potter, (Gareth Reeves) and his wife, Ginny (Lucy Goleby) are farewelling their son Albus Potter (Sean Rees-Wemyss) on his way to Hogwarts. Also farewelling their daughter, Rose Granger-Weasley, (Manali Datar), also heading for Hogwarts, are Ron Weasley (Gyton Grantley) and Hermione Granger (Paula Arundell). 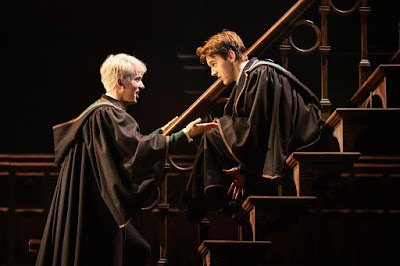 Although Harry has cautioned Albus to avoid contact with Scorpius Malfoy, (William McKenna), the son of his arch-enemy Draco Malfoy (Tom Wren), the pair meet up and soon become best friends, setting the scene for a series of adventures, involving time travel, flashbacks and magical transformations, which entwine both families. 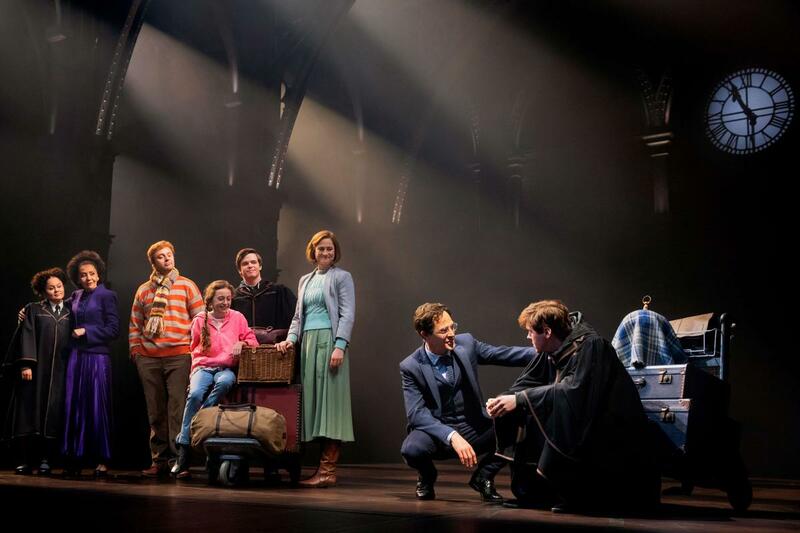 The flashbacks and time travel provide opportunity to incorporate references to incidents from the Harry Potter books which inspired this iteration, and although it’s not a musical, there’s plenty of music. Imogen Heap’s atmospheric score sets the mood for each scene, as staircases, suitcases, furniture and assorted props swirl around the stage. Nobody walks. Everybody hurries to, or from, somewhere. The actors swirl capes and deliver their dialogue in heightened tones, bringing a sense of urgency to every scene. 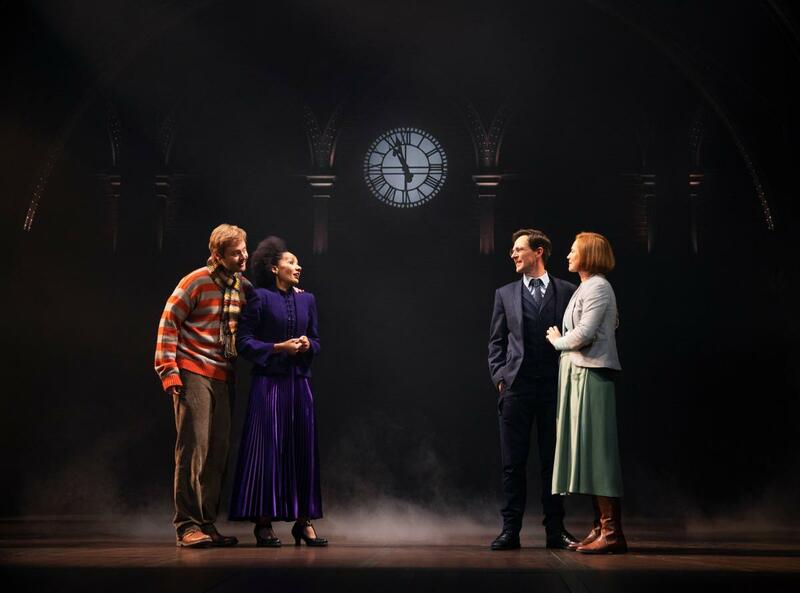 John Tiffany’s direction is masterly, carefully focusing the audience’s attention on the complex storyline which he punctuates with jaw-dropping illusions while disguising set and costume changes with dazzling movement as meticulously choreographed as any ballet. His masterstroke however is obtaining interesting and absorbing characterizations from his actors amid all the razzle dazzle staging. In a very strong cast, many of whom play several roles, relative new-comer, Sean Rees-Wemyss as Albus Potter and William McKenna, making his professional debut as his unlikely bestie, Scorpius Malfoy, both give engaging, star-making performances. Manali Datar also makes a strong impression in her first professional role as the effervescent Rose Granger-Weasley. 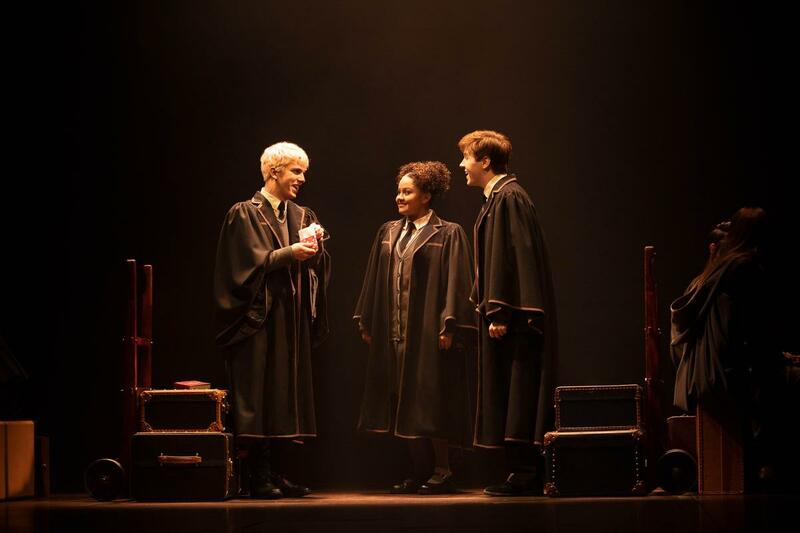 Gareth Reeves and Lucy Goleby give stylish performances as Harry Potter and his wife, Ginny, while Gyton Grantley captures most of the laughs as Ron Weasley. 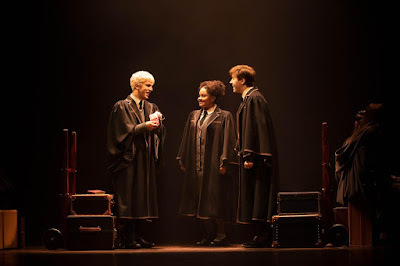 Paula Arundell is quite magnificent as Hermione Granger, and white-haired Tom Wren brings a conciliatory tone to his interpretation of the villainous Draco Malfoy. Among the many cameo roles Gillian Cosgriff is a stand-out as Mad Myrtle and Soren Jensen is memorable as both Sorting Hat and Hagrid. 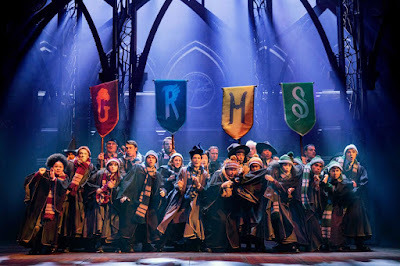 Although it was clear that the many Potterphiles in the audience, costumed proudly in their House scarves and beanies, were clearly grooving on the Potter mythology references scattered throughout the show, this critic, who has read none of the Harry Potter books, found this no disadvantage, quickly becoming engrossed in the cleverness of the storytelling, and the magnificence of the staging which incorporated the whole of the Princess Theatre, newly decked out in Hogwarts carpet and light fittings as part of a multi-million dollar renovation in preparation for this production, destined to be a must-see experience for anyone visiting Melbourne in the foreseeable future. 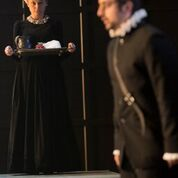 Helen Thomson and Caroline Brazier in Mary Stuart. Powerful, thought-provoking and harrowing! 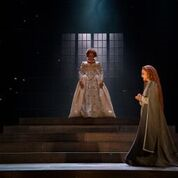 Kate Mulvaney’s adaptation of Friedrich Schiller’s Mary Stuart not only depicts the historic and dramatic relationship between Mary Stuart, Queen of the Scots, and the English Queen Elizabeth l but is also historically significant as an adaptation of the early nineteenth century German play by an award winning Australian female playwright. Mulvaney brings a contemporary perspective to a play more traditionally concerned with the patriarchal politics of a society. With Lee Lewis as director, Mulvaney places Mary (Caroline Brazier) and Elizabeth (Helen Thomson) as the progenitors of their own destiny, rather than merely the political pawns of a male dominated autocracy. It is Elizabeth who orders the imprisonment of Mary for nineteen years, finally being incarcerated in Fotheringay Prison on the charge of treason. It is Mary who foolishly aligned herself with rebellious forces that threatened to usurp the English throne. It is Elizabeth who must sign the death warrant. It is the two womenwho must navigate the perilous pathway, strewn with the lustful ambitions of powerful men. Lord Burleigh (Tony Cogin) lusts after Mary’s execution. Robert Dudley, Earl of Leicester (Andrew McFarlane) lusts after Elizabeth and the power that such a union would entail. Lord Shrewsbury (Peter Carroll) offers the venerable voice of reason but is powerless before the hierarchical will of Burleigh. Mary’s gaoler, Paulet (Simon Burke) is equally powerless. His nephew, Mortimer (Fayssal Bazzi )succumbs to the fate of Papist loyalty. 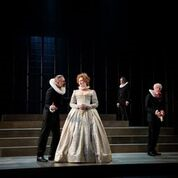 Helen Thomson’s Elizabeth is her father’s daughter, Gloriana, wilful, impetuous and capable of scathing wit and political cunning. Caroline Brazier’s Mary, in contrast is compelled to play the imprisoned victim, pleading for a cousin’s compassion and reason. In a meeting that never happened, we discover the inevitability of predestined expectation. Mary’s fate is ultimately determined, not by a woman’s act but by the will and law of men. They suffer the paradoxical consequence of possessing the divine right of kings in a world ruled by men. Thompson and Brazier are magnificent. Their performances, fired by Mulvaney’s text and director Lewis’s intuitive understanding set the stage alight with searing intelligence and forceful acting. They are finely supported by other members of the cast. The lights fade on Elizabeth’s serving girl (Darcey Wilson) as she scrubs the bloodied floor on bended knee. 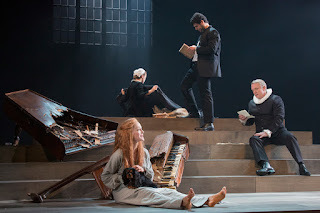 In a production of high drama it is a poignant moment of sheer pathos as the sombre and contemplative melody brings to a close Sydney Theatre Company’s outstanding production. 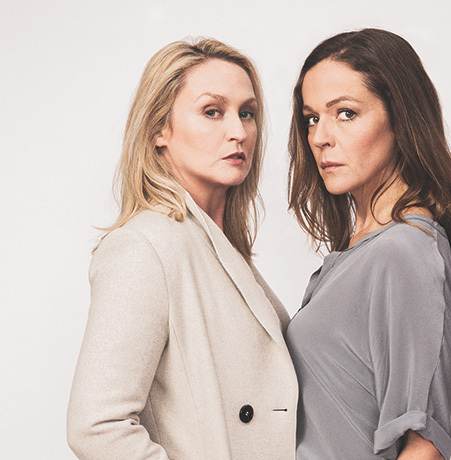 Mary Stuart is not-to-be- missed theatre worth every bit of a trip to Sydney.